Surveyed consumers are more optimistic about their future financial condition in the first quarter of 2012 than in the prior quarter, according to the University of Michigan Index of Consumer Sentiment. While most surveyed anticipated rosier financial conditions on the horizon, sentiment was still significantly lower than in the pre-recession years. Consumers were more optimistic about homebuying conditions in the first quarter compared to the prior quarter. 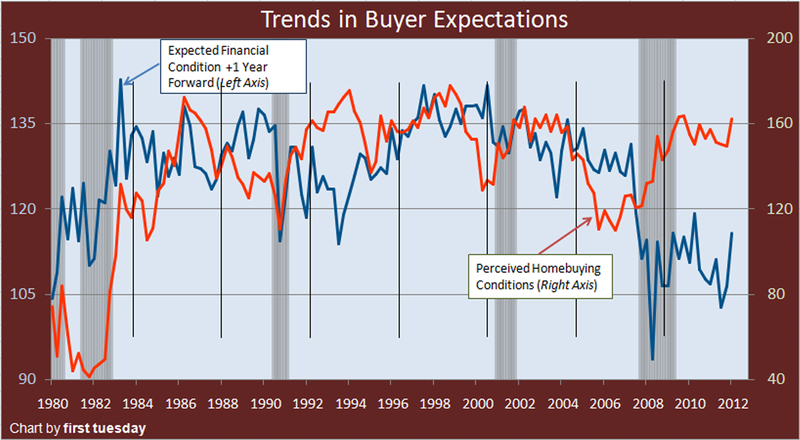 Perceived homebuying conditions remained high by historic standards. The greater the percentage of positive answers, the higher the index figure. Agents and brokers who follow the indexed trend of both lines will improve their awareness of the way homebuyers are likely to behave in the following months when deciding whether to make an offer to buy a home. The Western Census Region includes all states west of Texas. Most of these states experienced economic and home-pricing drops during the Great Recession. When looking at this data, however, keep in mind that California’s economic recession and financial crisis were fueled by a more extreme drop in employment and real estate pricing than that experienced by the nation as a whole. 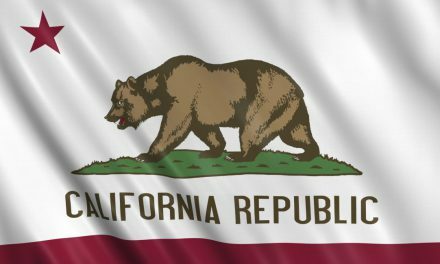 The real estate recovery will thus take a bit longer to develop in California and the southeastern U.S. (specifically the states from Florida to Louisiana, including Georgia) than in the northeastern or central parts of the country. where we are going, as current and anticipated optimism about the economy is easily translated into willingness to buy products, such as houses, and the level of buyer optimism or pessimism determines the durability and volume of these sales. To become or remain professionally successful, brokers and agents need to understand the past and accurately anticipate their future sales numbers. Future sales volume, and thus broker fees, is based on the likely reactions prospective homebuyers will have to the market. Successful brokers and agents pay attention to the factors driving tomorrow’s home sales, one of which is consumer confidence. Optimism, always present in the real estate industry, can lead to innovation. Such innovative spirit is best capitalized on by professionals who are aware of what is likely to happen in the future. Proper planning is thus an essential aspect of the creative process. When viewing both lines in the above chart, keep in mind that all responses to the University of Michigan’s poll are based on events that have already occurred: buyer pessimism about the economy is first and foremost a reaction to a recession in the western states that had already passed its worst point at the time of this writing. As more and improved (or adverse) facts and information become available, reported and absorbed, buyers change their opinions. Public opinion changes with the gathering of facts, from as little as 20% in favor of ownership, to 80% in favor just one year later. Brokers and agents need to observe the movement in the solid line for the current trend in homebuyer thinking about their ability to buy things, housing in particular. If the line is trending upward, the number of prospective buyers who believe they can actually buy a home in the near future is increasing. Thus, brokers and agents can get in position to capitalize on the information. Of more specific interest to real estate professionals is the red line. This line shows the general homebuyer perception of the housing market today: whether homebuyers are ready and willing to buy a home based on current real estate conditions. This reflects buyer perception of whether they can make a good deal on a property, based on the price and availability of suitable homes, as well as other factors like current mortgage rates. Editor’s note — A buyer’s ability to buy is a separate issue from their perception of that ability (their willingness to buy). At the time of this writing, the public believes it is a good time to buy a home, but they also expect to have financial trouble with their ability to pay the price required to buy that home during the next year. This suggests that most potential buyers are ready and willing to buy homes, and would do so immediately if they only thought they were able. Unfortunately, buyers presently lack (or feel that they lack) the funds for a down payment and the qualifications needed to obtain a mortgage. Further, buyers are afflicted by a persistent general pessimism about the economy which is normal during any recession and the following recovery period. The most likely result: continued low home sales volume well into 2013. To compensate for sub-optimal conditions as viewed by buyers, brokers must act to address the heart of the problem: the homebuyer’s perceived inability to pay for a home. Often this inability is based on factors beyond the broker’s control, such as the homebuyer’s employment. On the other hand, many buyers are just intimidated by the rumored scarcity of financing. Practicing brokers and agents are aware, however, that no such scarcity exists. Thus, they must advertise the fact mortgage money is absolutely available so it becomes part of the public information buyers see and absorb, and in turn change their minds. For a full recovery, of course, homebuyers must not only accumulate sufficient savings to fund a down payment of up to 20% of the purchase price (but as little as 5% for a Federal Housing Administration (FHA)-insured loan), they must individually believe their access to mortgage funds will remain stable. 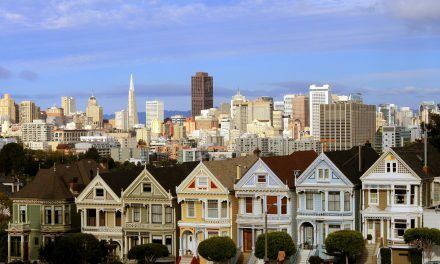 When buyers’ personal financial expectations begin to rise, due to an anticipated recovery from the historic loss in statewide home values (which started in early 2006 and still has not bottomed at the time of this writing), we will know a recovery of real estate sales volume is underway. The expected financial state of consumers one year forward, as shown by blue line on the chart above, indicates a greater likelihood that the public will purchase a home in the upcoming twelve months. This number is read as an indication of whether homebuyers expect their finances to be sufficient to buy a home within one year, based on savings and mortgage availability. The contrasting number, the consumer perception of homebuying conditions, shows whether buyers feel confident a home is an appropriate investment today. When these two factors rise together, as they did in the mid-1990s and the early 2000s, home sales volume will soon begin to rise. This rise, when it next occurs, will indicate it is time for farsighted brokers and agents to prepare to take their share of that future action. After one year of increasing sales volume, a gradual rise in home prices will follow. However, these improved sales and pricing conditions are not expected until 2013 and 2014, respectively. Consumer pessimism is very slow to break down after a recession, and will linger throughout the several years of a recovery. Additionally, the massive financial crisis was a concurrent detriment which will likely take longer to resolve than the consumer recession, which is not a good omen for a quick real estate recovery. the expiration of government homebuyer subsidies. These factors are now functioning in a positive manner and will produce a most favorable trend. Together, these factors give brokers and agents the information they need to descry a rough outline of the future, and help them outwit their professional competition. the relevance of the trend to present market conditions, determined by its confluence with other factors driving real estate sales. an increase in second home buyers. All of these unsustainable factors were observable at the time and set the stage for the unstable conditions which would ultimately lead to the crash of 2008. Your article lumped all Buyers into the “employed” category, which is not really homogenous. What is happening with the self-employed category? My impression from a couple of years ago, was that Lenders were extremely gunshy about lending to small business men & women. Are there any fresh related data? I thouroughly enjoy your newsletters and articles. I know that you are an asset for my future endeavers.